A US archbishop has boycotted a visit by the Irish prime minister over the Irish government's plans to allow abortions in certain circumstances. Cardinal Sean O'Malley, the Catholic Archbishop of Boston, has accused Irish PM Enda Kenny of "aggressively promoting abortion legislation". 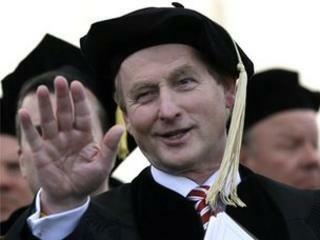 Mr Kenny was invited to Boston College, a Catholic university, to receive an honorary degree and to give a speech. The archbishop of Boston traditionally gives the blessing at the annual event. Cardinal O'Malley did not attend Monday's graduation ceremony, but a demonstration was staged by a group of protesters who urged the college to maintain its anti-abortion values. A spokesperson for Boston College said the institution regretted Cardinal O'Malley's absence, but added that its commitment to Catholic values had not weakened. The Republic of Ireland has some of the most severe restrictions on abortion in Europe, but a bill is currently being considered in parliament that would legalise abortion if there is a real and substantial risk to the life of the mother, including the threat of suicide. The Irish government has been under pressure to clarify the right of doctors to perform life-saving abortions since late last year, when an Indian woman with serious complications with her pregnancy, died in an Irish hospital after being denied an abortion. Savita Halappanavar, 31, died in University Hospital Galway last October. Her family claimed she might have survived if doctors had granted her requests for a termination. Last month, an inquest into Mrs Halappanavar's death returned a verdict of medical misadventure. The Galway coroner recommended that new guidelines be issued on when doctors can intervene to save the life of a pregnant woman in the Republic. Days later, the Irish cabinet reached agreement on the controversial draft legislation that included the credible threat of suicide as grounds for a termination. At the time, Mr Kenny said it did not amount to a change in Irish law on abortion but he added the draft bill would bring certainty to pregnant women and legal clarity to doctors. At the Boston ceremony on Monday, he was presented with an honorary Doctor of Laws degree and was invited to address graduating students.